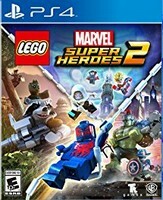 I am thankful Family Friendly Gaming was given a digital download code for LEGO Marvel Super Heroes 2 on the Playstation 4. I know many of ya'll are asking about an Unboxing video of LEGO Marvel Super Heroes 2. Since we were given a digital download code we are not able to do an Unboxing video. Sorry about that. Maybe at some point in the future Family Friendly Gaming will purchase a physical copy and do an Unboxing video. Be sure to get in your donations, views of our original videos, and advertiser sponsorships. LEGO Marvel Super Heroes 2 has really nice music. Certain voice actors in LEGO Marvel Super Heroes 2 feel wrong. Maybe because I watch the Marvel movies and I am used to certain voices in certain characters. Guardians of the Galaxy play a huge role in taking down Kang the conqueror in LEGO Marvel Super Heroes 2. We visit all kinds of different eras and characters in LEGO Marvel Super Heroes 2. There are a lot of characters that can be played in LEGO Marvel Super Heroes 2. TT Games also upped the interactions. We do more than just press a button or mash on a button in LEGO Marvel Super Heroes 2. Pay close attention because that system has been expanded greatly. The installation of LEGO Marvel Super Heroes 2 is 18.1 gigs. That is before any updates that may come out. LEGO Marvel Super Heroes 2 did crash on me multiple times while playing through the game. The free roam in LEGO Marvel Super Heroes 2 did not have much in it. There was a great opportunity to have more gold bricks but it was lost. LEGO Marvel Super Heroes 2 has magic, false gods, and violence. We knock apart a plethora of Lego objects and characters in LEGO Marvel Super Heroes 2. There are newer and politically correct characters in LEGO Marvel Super Heroes 2. The boss fights in LEGO Marvel Super Heroes 2 felt really slow and bland to me. A lot of it felt repetitive to me. The cool thing in LEGO Marvel Super Heroes 2 is all the different characters. I loved playing as Lego Hulk for instance. There are levels and areas that reference recent Marvel movies in LEGO Marvel Super Heroes 2. Which is really cool. Expect to swap characters for certain skills to progress in LEGO Marvel Super Heroes 2. Which comes with all Lego video games. I had a lot of fun playing LEGO Marvel Super Heroes 2. There are good and bad elements in the Marvel fantasy universe. LEGO Marvel Super Heroes 2 brings us the Marvel fantasy universe with all of its good and bad. Two family members can play LEGO Marvel Super Heroes 2 at the same time. There is also drop in and drop out functionality in LEGO Marvel Super Heroes 2.